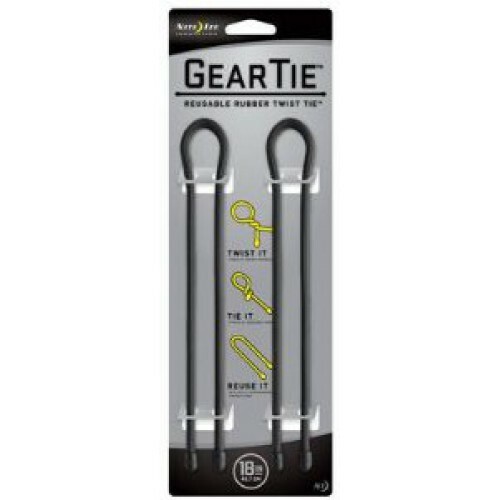 Nite Ize 18" Gear Tie Reusable Rubber Twist Tie is the perfect size to wrap and organize medium-to-large appliance cords and wires. Made of a sturdy, colorful rubber exterior with a strong bendable wire interior. Keep your jumper cables, extension cords, dog leashes, and larger electric cords neat and untangled with a quick simple twist. The 18" Gear Tie is also great for looping and hanging lightweight tools and lanterns, and reusable nature makes it easy to reposition and adjust conveniently. Wraps, ties, and organizes medium-sized cords, devices, and tools, in a twist. 2 Pack Size: 18" Color: Black Waterproof and safe for use in fresh or salt water without damage UV resistant - will not be damaged or destroyed by extended sun exposure Tough rubber shell provides excellent grip Use indoors and outdoors in any weather. Strong wire inside holds its shape Won't scratch or mark Twist it, tie it, reuse it Thousands of Uses! 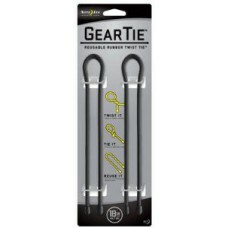 Use Gear Ties in the garage, on the boat, in the home, and in countless other places where things need to be secured and organized. Dimensions: 18.00" x 0.40" x 0.40" (457.20mm x 10.26mm x 10.26mm).